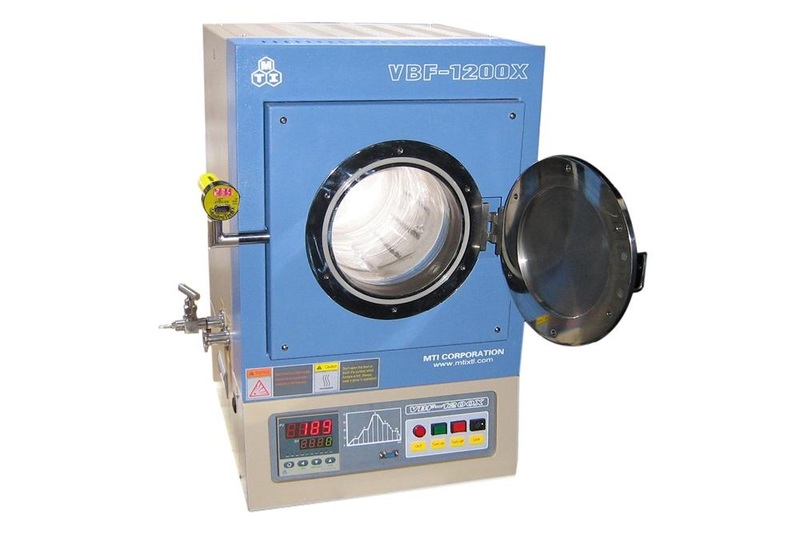 VBF-1200X-H8-UL is a compact vacuum chamber furnace with a 7.5" ID x 13.4"L heatable quartz tube chamber placed horizontally. Water-cooled stainless steel vacuum flanges with valves are installed to achieve a vacuum atmosphere of 10-2 to10-5 torr through the use of a mechanical or molecular vacuum pump. All electric components are recognized by UL and ready to pass CSA, UL inspection. High quality Ni-Cr-Al resistance wire as heating elements and can be heated up to 1200°C. Stainless steel vacuum flange with dual high temperature silicone O-rings at front door. One needle valve is built into the flange for use as gas inlet. One KF25D port on left side of furnace for connection to vacuum pump. A water cooling jacket has been built inside the flange to protect the vacuum sealing assembly from melting at over 300°C. The inlet and outlet ports located on the left side of furnace are used for connecting to a water chiller through two 12 mm dia. polyurethane tubes (water chiller is sold separately). Please click here to review detailed info of the water chiller. A Quartz Thermal Block (filled with fibrous alumina) is included to prevent heat radiation and dissipation. It also provides excellent vacuuming while ensuring a clean environment inside the chamber. Optional: If using the furnace for flat samples, a flat sample holder (pictured left-bottom) can be ordered. KF25 Vacuum Fitting with KF25 Right-Angle Valve for quick connection to KF25 Bellows.